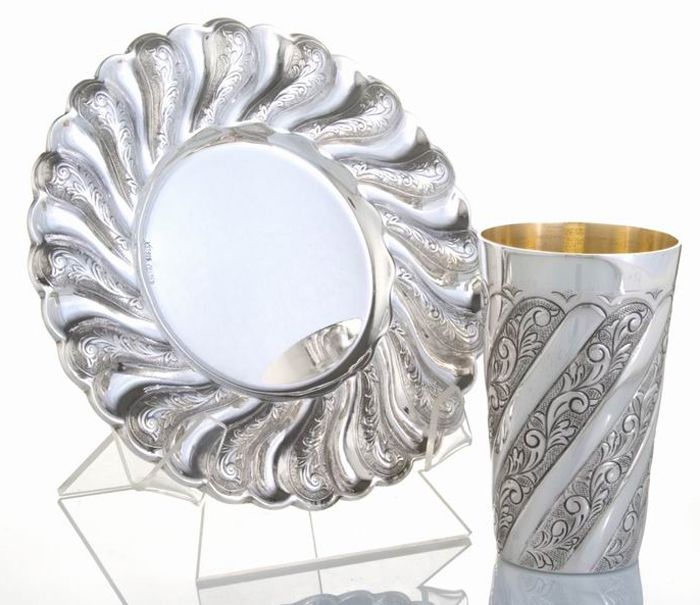 What could be a better Chatan gift (wedding gift) than a Kiddush cup and matching saucer set, handcrafted in sterling silver? Wine is part of any festive Jewish meal, so give the new couple a wedding present that will let them do honor to the fruit of the vine at many, many happy Shabbat and holiday occasions. This sterling silver Kiddush cup and saucer set is decorated with panels in the Toscana floral pattern that alternate with sleek panels of polished sterling silver. The alternating silver panels angle down the sides of the flat-bottomed Kiddush cup (no foot). The silver cup features a smooth straight-edge rim. The silver saucer of this set has a raised swirl border and repeats the alternating Toscana floral pattern-plain silver panel decorative motif that appears on the cup. The kiddush cup holds the Shiur (halachic amount) of wine required to recite the Kiddush blessing. As only Jewish artists created this item, there is no need to Tovel it (immerse it in a Mikvah). Total weight:.55 pounds(249 grams).